I think I’ve finally found a wireless network topology that works at my house. It took a bit more equipment than I think should have been necessary, but in the end, it was a small price to pay for having my increasing array of network-dependent devices running smoothly. Since my guess is that there are a few other suckers like me out there trying to get this to work, I’ll share my final solution. Now, it’s not like the above happened all the time. I never had a problem with an iPhone / iPad / Windows laptop / MacBook connecting to the network. It was largely restricted to my video devices. Unfortunately, it was infrequent enough that I could believe everything was configured correctly, but often enough that deep down, I felt like there were Gremlins in the building. The culprit turned out to be a circa-2008 Airport Extreme that I was using to drive my 802.11N network from the office. It turns out, the older Airport Extreme can handle either 2.4Ghz or 5Ghz frequencies, but not both simultaneously. Since the iPhone / iPod uses 2.4Ghz, for compatibility you are effectively stuck at 2.4Ghz. In addition, my office is literally at one corner of my house from the bedroom. Not ideal, spatially, for the hub of my network. The living room is more centrally located. I began to suspect that the number of wireless devices that I owned had crossed some threshold, and the amount of interference and cross-talk was leading to unpredictable behavior. It’s a little tricky, but there is no option to extend a network under the default set-up flow. 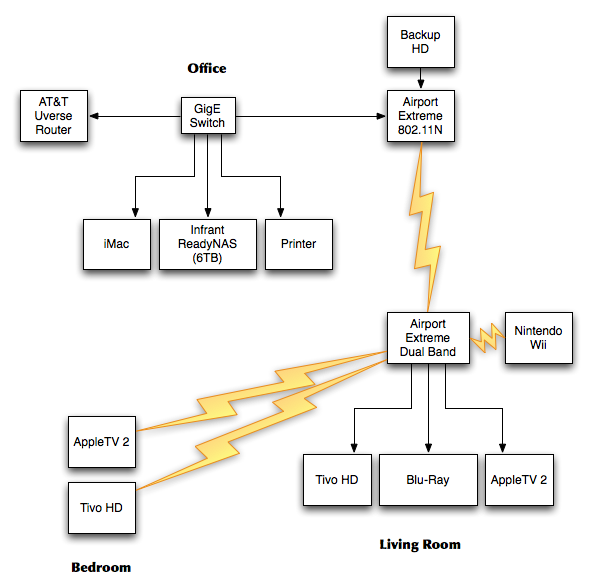 All the devices in the living room are now connected via Ethernet to the Airport Extreme base station. Significantly less chatter on the network. The bedroom devices are selecting the living room base station instead of the office due to signal strength. Basically, there is a fairly constant 2.4GHz wireless “pipe” between the Living Room base station and the Office base station, and devices through the house are auto-selecting to the best connection. The living room is aggregating the traffic over it’s ethernet switch and wireless endpoints, and then piping to my office network when necessary. In the office, my iMac (which is my iTunes server) is connected via a Gigabit Switch to the Airport base station, the Infrant ReadyNAS NV+, and the AT&T Uverse Router. I’m assuming that the bridging implementation between the two Airport Extreme base stations is extremely efficient – more efficient than having a large number of device independently competing for access to the base station in the Office. I’ve already noticed now that the new AppleTV 2 devices are extremely happy with this setup, and I get 720P HD streaming in both the living room and the bedroom from the iMac with only a few seconds of buffering. Hopefully, this should prove a durable and performant topology for 2011. Finally… we are getting a little bit closer to HD DVR nirvana. These instructions on Engadget show you how to hook up an external SATA drive to your Tivo Series 3 to upgrade the external storage. Apparently, the secret is holding down the “pause” button on your remote as the machine boots up, and then entering “62” at the right time. Too cool. Since you can get eSATA storage now in very large sizes, this is a great way to expand your Tivo Series 3 beyond the normal 250GB (30 hours) of HD storage. Ever wish you could use that friggin eSATA port TiVo taunts you with on the back of your Series3? If so your moment has finally arrived — and not a moment too soon for many a DVR-loving TV fans whose drives are filled to the brim with HD programming. Best of all: you don’t even have to crack open your box or nothin’. Ready to get it going on? Let’s upgrade that TiVo. Sorry, I had to add a quick post here about Apple TV. I had lunch this weekend with some close friends, several of which have worked for Apple in the past. And I was surprised at how negative they were about the Apple TV. First, check out this article on Seeking Alpha. It looks like the Apple TV may be blowing away expectations already, with 100,000 sold. Tivo Home Media Option 2.0. It feels like Tivo stopped innovating with the home media option once it got into trouble with it’s future as a company and a product. Right out of the box, the Apple TV takes the best things that I love about the Tivo interface, and brings them to my iTunes content. Tivo handles my iTunes playlists & iPhoto libraries just fine, but Apple TV takes support to the next level with support for iTunes Store content and TV/Movies/Music Videos. High definition is a plus, although I’m still living in the stone age of 480p. Media Server Heavy, TV Interface Light. I think this is the right model. You want a big, brawny server with loads of storage, and a lightweight client with smart caching to receive content. I honestly see my house with an Apple TV on every set instead of a DVD player. I know the first TV that’s getting one is the one in the kitchen, where my young son is just destroying DVDs left and right. No need for that – he can just pick from a menu. Goodbye AVI. Hello, MP4. I’m very excited about MP4 files, ripped with the H.264 codec. High quality, smaller files. A 2 hour movie seems to fit in about 1 GB. My friend John was very caught up with the lack of AVI support, and maybe he knows something I don’t. But to me, this just sounds like complaints that the iPod doesn’t support WMA. My prediction – the lack of support of AVI is going to turn out to be bad for Microsoft, and not hurt Apple TV. Now, there are plenty of features I’d like to see on the Apple TV. I’d like to see a concept of “libraries” of content, so I could make a library of kid-friendly content for my son. Maybe some sort of enforced filter or protection would be sufficient. I’m also worried about 802.11N scaling across my house, especially with multiple TVs going. I’m also concerned with the grey areas around ripping DVDs, versus the clear availability and accessibility of ripping CDs. Normal people need to be able to convert their DVD libraries to digital content easily, the same way that iTunes lets people convert their CD libraries. The wild card here is YouTube and other ventures. Depending on how much unique content avoids the MP4 format, the more inclusive Apple may have to be. With Google & Apple linked at the board level, however, don’t be surprised to see the Apple TV support YouTube at some point, in some form. I still would love a way to automate the conversion of my recorded Tivo programming into iTunes content. What I really would like to see is a Tivo Series 3 where the hard drive in the box is really considered cache storage – the real file store would be my media server, and the Tivo would archive all recordings to the server when it wasn’t busy. All sources would lead to the media server, my digital content receiver. And all paths out of the media server lead to devices like the iPod, iPhone, and Apple TV. But if that vision doesn’t work, maybe I need to rethink my $100/month DirecTV bill. Maybe with basic programming, I could save $40/month and put that money into acquiring content in other ways. My DirecTivo ate my 24 series premiere. Or more accurately, it failed to record the second 2-hour block last night. I caught it part way through. At 8:45pm, nothing was recording. When I checked, I saw that for some reason, while my Season Pass was there for 24, the guide showed “no upcoming episodes”. That was strange, since obviously one was playing on the screen. I hit record, and ran to the bedroom to discover, thankfully, that my 2nd DirecTivo was recording the show correctly. But how bad was this problem? I had a problem like this 2 weeks ago, when the Scrubs premiere failed to record. All the other shows recorded fine, but Scrubs was showing “no upcoming episodes” even though there clearly were shows in the guide. I found this post on PVRWire which went into some detail about problems people were having. I don’t buy the conspiracy theories about DirecTV trying to ruin people’s Tivo experience to get them to “upgrade” to the craptastic box that is the DirecTV-branded DVR. But bugs and issues can and do happen, and it made me realize how much I depend on my Tivo “just working”. I double-checked my To Do list for the week, and I discovered no less than four other shows that had the same problem. I manually added them to the To Do list, but I’m worried. I hope they fix this problem soon. A spokesperson on CNET has said “it is aware of the problem and should have it fixed by this evening (last Friday).” However, at this point in time DirecTiVo users are continuing to report problems.